France, 1700 — an age of wit and sophistication, frippery and flattery, reputation and ridicule; an age of politics, romance, intrigue and the sword. 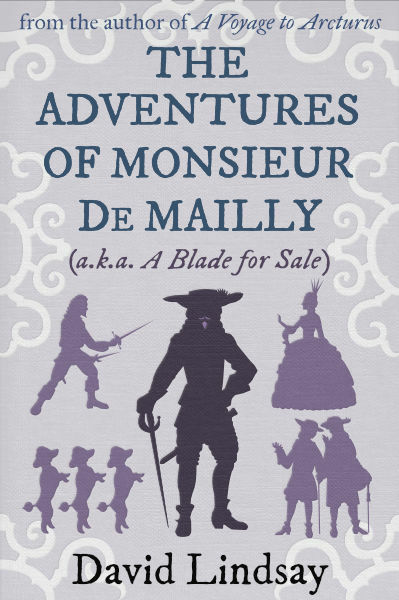 Gaston de Mailly, ex-solider and down-at-heel gentleman, is living in a Paris that has little use for his skill with a blade. Fortunately, his wit is equally sharp. Allying himself to the sceptical lawyer Fleurus, Mailly offers to try his hand at any case that can't be pursued through the normal channels of the law. And so, in a series of adventures ranging from Mailly having to save himself from a reputation-destroying joke at the Court of the Sun King Louis XIV at Versailles, to fighting his way out, with both wits and sword, from the tangles of an assassination plot, Mailly puts his shoulder to the Wheel of Fortune in an age of rapid rise and fall, sudden danger and artful deception. In the rakish charm and misanthropic wit of his hero Gaston de Mailly, David Lindsay, author of the early-20th century classic A Voyage to Arcturus, found a way to cut loose from his more serious fiction and indulge in theatrical intrigue, witty adventure and the artful picaresque to a highly entertaining degree. But readers of Lindsay's work will still find his key themes here: the lone hero caught between conflicting powers in a deceptive world; the individual's struggle to retain integrity in a constrained yet superficial society; and the search for a lasting and genuine soul-mate — all served with adventure and intrigue, wit and witticism, sword and poniard!